If you are a gaming enthusiast, or just want to build your own custom PC with the hardware components of your choice, a PC case is a necessary thing on that road. 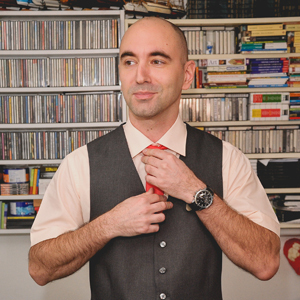 There are so many options, features, design solutions, sizes, that it is pretty easy for people to get lost. Because of that, first take a look at the most important aspects of the chassis that you should pay your attention to, and check our advice for some of the best PC cases you can find for your custom machines. They are all different and the fact that one suits your friend perfectly doesn’t necessarily mean it’s going to fit you too. Therefore, choose wisely and be patient, there is one for you too. Who doesn’t want something attractive to put all the fancy hardware into? Although it doesn’t have a real practical value, it makes us feel better if we are surrounded with something beautiful, that just makes us happy… and the same goes for PC cases. Before anything else, you need to be sure that all the hardware that you want to put in your custom PC can really fit there. Because of that, double check everything and be sure that everything can fit where it should. Also, if your available space is a limiting factor or you just want a compact-sized PC, the scenario is pretty much the same. As said previously, double-check everything. Because no one wants their hardware to fry, this is probably the most important aspect of any chassis. Depending on what you prefer or what better suits your budget – air or liquid cooling, PC case of your choice should provide good results in at least one of these categories. Ultimate gaming machines deserve liquid cooling, while air cooling is more budget-orientated. 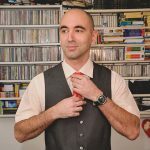 Whatever you chose, just be sure that the computer case cooling performance is more than pleasing and that your components will stay safe in there. Just like design, this is more of an eye appealing characteristic that a real practical value. Therefore, if you have a possibility to get yourself a case with fancy RGB LED, go for it, but if that means you are going to sacrifice better cooling or the needed space, don’t do it. Fancy lights will become boring after a while anyway. Obsidian 1000D is a huge PC case with a complete support for two full PC’s (there is a space for one E-ATX and one Mini-ITX motherboard and two PSU’s). Stylish, made out of brushed aluminium, with smoke tempered glass panels, this is a premium looking case that will satisfy even the most demanding gamers. There is support for 13 fans, up to four 480mm radiators, seven expansion slots for PCIe cards (nine when including vertical GPU mounting space), bays for 11 drives (five 3.5” and six 2.5” drives), two USB 3.1 Type-C ports and four USB 3.0 ports on the front panel. Everything you would expect from the best PC case is there. When it comes to its size, cooling and expansion options, this PC case just doesn’t have much of a competition. This is simply an amazing casing destined for the best custom PCs out there, and besides rough cable management and the price, it has no other bad sides. Thermaltake View 91 RGB is a great PC case that can be compared even to the stunning Obsidian 1000D. Although it doesn’t have the dual motherboard and PSU support as the Corsairs rival, it delivers great cooling versatility with support for 200mm, 140mm and 120mm fans (depending on configuration and the size of the used fans, there is space for 8 to 15 fans), and up to four radiators, that makes it better in that department than Obsidian 1000D. Also, it is worth mentioning that it provides more drive space, 12 compared to Obsidian’s 11. 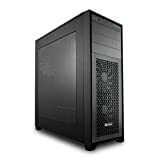 Sleek looking, with tempered glass panels to show its internal hardware and with support for CPU coolers up to 200mm in height, graphical cards up to 600mm in length and PSU’s up to 220mm in length, this XL-ATX super tower is constructed for high-end workstations and users that accept no compromise. If you want the best tempered glass PC case for your custom made “beast”, look no further, Thermaltake View 91 RGB is waiting for you. The majority of the Corsair cases have something in common: they are easy to assemble, have a clean design, great liquid cooling and one not-that-good characteristic: mediocre stock air cooling. Luckily, 750D is an exception to this rule and it delivers better than a competitive performance in that department, but doesn’t show such good results with overclocked multi-GPU configurations. In general, 750D is a very useful case that offers space for up to 10 drives (that include four pretty handy tool-free dedicated SSD cages), nine PCIe slots, and space for eight fans. It is made out of solid steel and brushed aluminum and all in all, presents more than a good value for the money. Yes, it needs a bit of specialization, but every gaming enthusiast that uses water cooling would be very satisfied to have something like this in his or her disposal and not have to invest a kidney in order to buy it. Cooler Master Cosmos C700P is a PC case made of premium materials, with exceptional water-cooling support, space for nine fans (120mm or 140mm), nine drive bays, plus space for two SSD’s and fully modular build, developed for high-end gaming configurations and workstations, with intention to be the best gaming pc case there is. Although modularity might show as a disadvantage compared to cases that are more specialized for a certain layout, Cooler Master has done a proper job with this one, offering a plenty of options that put the C700P in a position to have very little or even no competition in this department. This case isn’t perfect, it has too much plastic for a case of this class (especially front panel), it lacks some dedicated pump or reservoir mounts for custom water-cooling, etc. but these are all minor things, and the overall impression is that C700P is a decent update to Cosmos series. When compared to the direct competition, such as Enthoo Evolv ATX TG and View 71 TG, it delivers higher temperatures during air cooling, but offers much quieter work, although the overall cooling-to-noise ratio is still on the side of the competition. 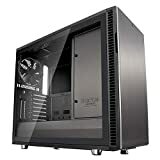 It’s a fact that this PC case is a quality product, with a vast number of options, but its price tag is something that needs improvement, especially when its air cooling is taken into calculation. It is good, but not as good as the price tag suggest. An outstanding quality of build, unique look, space for nine fans, a place for seven 3.5” plus one 2.5” drive (each 3.5” slot may be used for two 2.5” drives), and Qi Charger are just some of the features that BGW11 Dark Base Pro 900 has to offer. But its most valuable characteristic is its silent work that comes as a result of its build and noise-cancelling foam that is implemented in it. Even at the high fan settings, this case offers quiet work, while when it’s in idle mode it is almost completely silent. 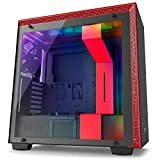 Dark Base Pro is definitely the best silent PC case you can buy for this amount of money, but there are also some weaknesses that prevent this case from being amazing. First of all – it’s not that good air cooling, because of which the majority of its components are hotter than with the competition. 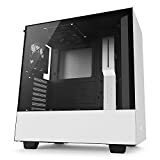 Also, for smaller amounts of money you can find cases with similar features, but with better air cooling, such as the Enthoo Evolv ATX Tempered Glass. On the other hand, it must be noted that Dark Base Pro 900 is primarily made for water cooling, in which it is brilliant, and that air cooling is just an addition, which gives a completely different perspective to the overall impression of Dark Base Pro 900. Riotoro CR1288 Prism is basically an upgraded version of the Riotoro CR1280, which has a lot of fans and was rather successful. Prism is built on that positive wave and it keeps all the good characteristics of its predecessor and offers improvements in many departments (a redesigned front fascia, quieter work, more advanced RGB lighting features, much better cooling performance). Also, Prism offers more space for radiators and fans (there is space for six 120mm fans or five 140mm ones) and it delivers eight drive bays (four 2.5” and four 3.5” drives) and eight PCIe slots. Its design isn’t amazing and some will like it, while others won’t, but the truth is that it delivers all that it needs to. Enough space for drives and cabling, spacious PSU compartment, good airflow for decent configuration, and the chassis is simple to use. All that you would expect from the best full tower PC case, and all that for a reasonable price. Thermaltake View 71 RGB is a prime example of how the quality of build doesn’t always go hand in hand with performance. 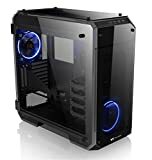 This case offers great system cooling and you can be sure that your gaming motherboard will be safe with this one, no matter for how long you play your favourite title. Yes, because of this it is a bit noisier than the competition, but the cooling-to-noise ratio is still on its side. It must be stated that its biggest rival Crystal 570X that offers a bit more features like extra fans, power supply shroud for hiding cables, better quality build, etc. is far behind Thermaltake View 71 RGB when talking about performance. A quality build is View 71 RGB’s major weakness, but still, its performance advantage over the competition makes it an acceptable loss. Thermaltake View 71 RGB is constructed out of four 5mm tempered glass panels, it is fully modular and offers tool-free installation of up to 10 storage drives, has space for up to nine fans and it offers eight slots that are reserved for more costly PC case alternatives. 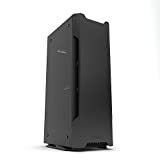 More importantly, this case offers a better performance than most of its competitors, including Crystal 570X and Dark Base Pro 900, but for the considerably lower price, which makes it an even more attractive alternative and a great solution for the best gaming PC case. Gamers tastes in design run the gambit from neon-drenched clear cases to boxes that have a more industrial design. The Cooler Master MasterCase H500 falls into the latter category as it’s suitable for your gaming cave or living room. The MasterCase H500 has a modern design with clean lines and a lightly tinted tempered glass panel on the side. From the front, you’ll be able to see the two included 200mm RGB fans, but you can switch out the panel as you’ll get mesh and acrylic options. The front of the case is also large enough to accommodate a 360mm radiator in the front along with 240mm of room for another up top. On that note, Cooler Master put a handle on the top of this ATX case which makes it more portable than some of our picks. The case has 7 expansion slots and room for a couple of combo drives or 2.5-inch SSD’s. While it only comes with two RGB fans, it has another fan in the rear and support for several more. This good looking case has a standard 1-year from Cooler Master. NZXT H700i is a premium mid-tower case with an excellent cooling efficiency and pretty handsome looks. When compared to the competition, such as Antec P110 Luce, Bitfenix Enso, and be quiet! Dark Base 700, it shows much better results, especially in the cooling department. With this one, you can be sure that your configuration will stay stable and that all of your components will be perfectly safe, including your gaming hard drives, motherboard, etc. 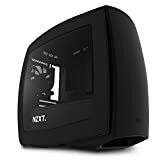 Equipped with seven fans, seven bays for 2.5” drives and 2+1 for 3.5” drives, tempered glass side panels and with a smart choice of color, NZXT H700i offers a nice-looking product with decent features, but for a too high of a price. Yes, its cooling is amazing, it looks very attractive and is among the best computer cases out there, but its price is just too high. 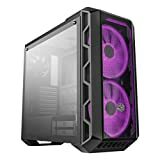 For a very attractive price, Rosewill CULLINAN RGB offers a great quality build, with glass on three sides and the outstanding four fans that are included in the package. Other than this, you will end up with pretty good cable management and the possibility to install up to nine storage drives without compromising any other features. Equipped with RGB fans (there can be six fans max), Rosewill CULLINAN RGB allows for their easy color and speed change, while its inside is pretty spacious, guaranteeing that all your hardware will have their place. 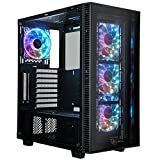 This is among the best cheap PC case models on the market right now, simply a great chassis, very cool looking, with a quality build, a decent list of features and last, but not least, a very competitive price. Gaming cases can take a beating over their lifetime, and if you have high-priced components, you need protection for the guts. If build quality and design are important to you, look no further than the Define R6 from Fractal Design. This mid-tower ATX case has room for nine fans and gives you a full view of your layout with a massive glass panel. That panel is tempered and scratch-resistant but dampened to keep the noise down as well. There are three 140mm fans pre-installed and plenty of space for water cooling support and multiple radiators. It’s also very roomy with 9 expansion slots and a hybrid drive bay system built to handle a wide variety of configurations. From its sturdy steel exterior to that large tempered glass panel, this case is built like a tank. Fractal Design put a lot of thought into this optimized case, and it gets high marks all-around in our book. It’s a bit pricey, but well worth it if you want a clean case that will last a lifetime. NZXT H500 comes with a clean design, two RGB LED strips, lighting controller; it takes up to four fans and supports 2+1 2.5” drives and 2+1 3.5” drives. Although mid-tower, it is pretty compact, large enough to accept the full ATX board. It is completely made out of steel, other the side panels that are tempered glass-made, which gives the chassis an impressive look – one of the best PC case designs out there. Made from premium materials, in a couple of color schemes, with a vertical GPU mount, and cable management that is absolutely superb, NZXT H500 is a real bargain. Very affordable, with premium features, quality made – this chassis is just a dream come true for any custom PC maker. NZXT Manta is a specific mini-tower case because of its rather massive size for this type of chassis. Made for high performance and for various liquid cooling systems, this PC case aims to be a full gaming PC, but in a bit of a smaller edition. Large for its class, it offers an elegant design with smooth lines that are inspired by the NZXT’s very popular Lexa series. Thanks to its excellent design and lack of any serious weaknesses, other than the fact that it doesn’t support tall air coolers and a bit of a hefty price, NZXT Manta is the best-looking PC case of this class without any doubt. When we also add the support for five fans, space for five storage drives, easy cable management, enough room for advanced gaming systems and two liquid cooling radiators into the equation, NZXT Manta becomes an even better solution for various gaming enthusiasts. Phanteks Evolv Shift isn’t just an ordinary PC case; its solid build and aesthetically attractive looks achieved with a combination of aluminum and tempered glass are just some of the features that support its one of a kind status. 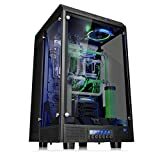 This is a PC case that is built for all-in-one liquid-cooling, although it also supports regular air cooling (but its performance in that department is not that good to be seriously considered). With support for three storage drives, dual all-in-one coolers, SFX-L PSUs, full-sized graphics cards, and equipped with the movable/rotatable GPU bracket, Phanteks Evolv Shift quite surely offers much more than you would expect from the chassis of this size. For all those who want something extraordinary, and at the same time, affordable, Phanteks Evolv Shift is a great solution. This isn’t the perfect case, it has its disadvantages, but if you consider its practicality and uniqueness, this is for sure the best budget computer case of this size. If you want to find yourself a cheap, compact-size case that will be able to handle and accept a lot of hardware, SilverStone Technology ML08B might be a great choice. 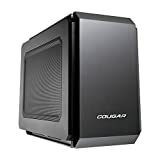 Although more expensive than for instance the Cougar QBX, this is still a good deal. It costs more, but it offers a lot of hardware space in a much smaller package, which is very important for this type of cases. SilverStone Technology ML08B is pretty much the same case as the SilverStone RAVEN RVZ02; their key difference is their external appearance, besides that, everything else, including performance, is pretty much the same. Its minimalistic design offers no space for fans and accepts only two or three 2.5” drives, depending on the size of the other components. 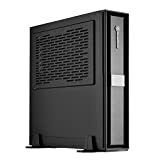 Although this is not the best small PC case on the market, it delivers all that is expected from such a mini-packed device, and all that for a decent price. When talking about the Cougar Case QBX, the first thing that comes up is its elegant design, which already won a trade show design award. That, along with its low price, is this case’s main selling point. When talking about its performance it doesn’t deliver anything stunning – it is solid, but not great, especially with its stock 92mm fan. 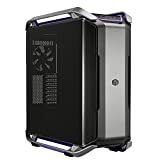 Cougar Case QBX has a good airflow of the main system and it can handle some larger thermal loads. It can be equipped with seven fans, while it offers space for just one 3.5” storage drive and up to four 2.5” drives. Of course, the type of equipment you are going to install inside will require a lot of calculation, because there is a limited space inside and all has to perfectly fit. All in all, its good price, amazing design and rather solid performance make Cougar Case QBX one of the best mini PC case models you can find. These PC cases were just suggestions that you should observe more like a guideline and not like a must. They’re here to help you with your choice and if they did that, their purpose is fulfilled. However, we are convinced that you’ll be able to find your best fit somewhere on our list, or at least get the idea of what you are looking for. Good luck, and enjoy your new PC case!